Jamaica Blue Mountain is the king of gourmet exotic coffees and, following the merger of Blue Mountain Coffee (Europe) Limited and the Edmonds Group, the new company, Blue Mountain Coffee Group Limited (BMG) is able to offer the widest range of Jamaica Blue Mountain estates and producers in Europe; from the well-known Clydesdale and Mavis Bank brands to our portfolio of Estates – Blue Baron, Cinchona, Flamstead, St. Clouds and Stoneleigh, plus the uniquely Rainforest Alliance certified Clifton Mount Estate. Full details of our processor producers and portfolio of single estates provided on request. BMG in fact represents the amalgamation, based on proven pedigree, of the two longest Jamaica coffee industry serving entities in Europe with deep and decades-established roots in Jamaica where we have farming and processing joint-venture investment arrangements with our Jamaican partners. Our philosophy is based on the highest product quality and social, ethical and environmental responsibility working closely with our Jamaican partners. We deliver the coffee to our customers applying the just in time principle to provide for the quickest possible delivery times from stocks held in our European depots. This service is offered to large, medium and micro roasters either directly or through our regional distributors. Available quantities of Jamaica Blue Mountain coffee are not large but we are working with our Jamaican partners, and with our European distributors, to ensure that regular customers are always in-stock. To this end, we hold our principal stock in Antwerp (Katoen Natie) and Abingdon in the United Kingdom with subsidiary stocks in Hamburg, Barcelona and Trieste, managed by our distribution partners. We have a programme of regular topping-up and replacementfrom Jamaica in place. Jamaica Blue Mountain coffee can claim its origins from a decision taken by a French King in the 18th Century. In 1723, King Louis XV sent three coffee plants to the French colony of Martinique - another lush, fertile island 1,900 kilometres south-west of Jamaica. Five years later in 1728, Sir Nicholas Lawes, Governor of Jamaica, received a gift of one coffee plant from the Governor of Martinique. The rest is history. From that one Arabica coffee plant, an exquisite coffee was introduced to the world. This one plant was nurtured and a plantation grown. Within nine years, the first coffee was exported and the Jamaican coffee industry was born..
Arabica coffee loves the nitrogen and phosphorus-rich soil of Jamaica and nowhere else better than the steep elevations of the Blue Mountains. Located north of Kingston on the eastern side of the island, the Blue Mountains rise to elevations of 2,350 metres. The bean cultivated is mostly Arabica Typica. The coffee thrives in the fertile, volcanic soil, regular rainfall and, most importantly, under the island’s misty cloud cover, to shade it from the burning sun. All these factors combine to develop coffee with exceptional sweetness and aroma, rich flavour, and full body with mild acidity. To be called Jamaica Blue Mountain coffee, it must be grown at altitudes of up to 1,800 metres in the Parishes of Portland, St Andrew, St. Mary and St Thomas; comprising an area of some 6,000 hectares – the size of a large estate in one of the high volume coffee-growing countries. Coffee farming in the Blue Mountains is characterised by mostly small holdings of up to 4 hectares but there are larger estates of up to 70 hectares in size. 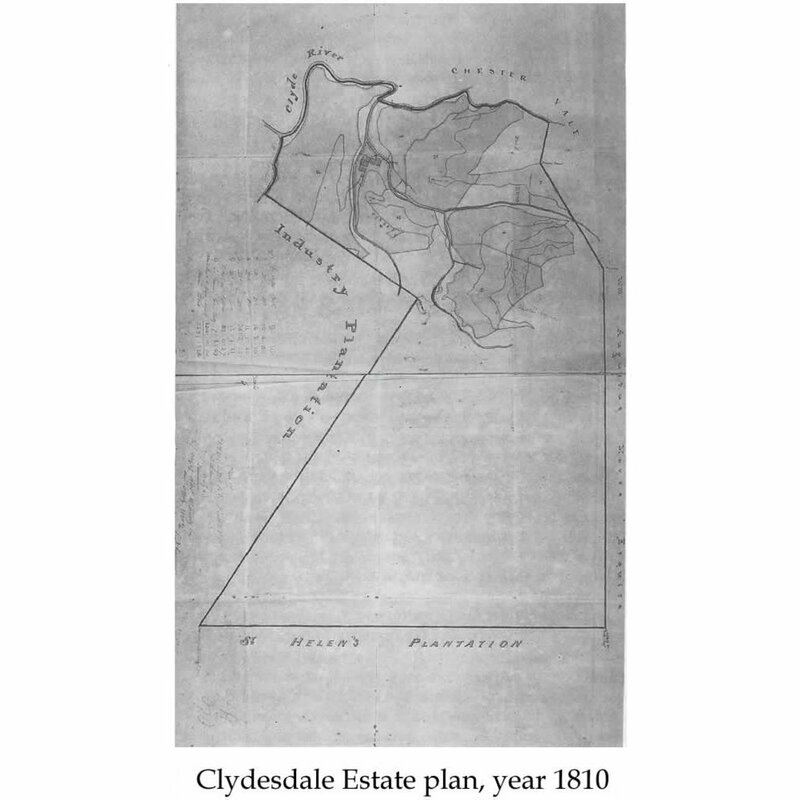 There are around 15,000 small holders and estates in total. The result is what many regard as the best coffee in the world and the “Champagne of Coffees”. Like France’s ‘Appellation D’Origine Contrôlée Champagne’, which strictly controls where authentic Champagne grapes may be grown, the area where Jamaica Blue Mountain coffee plants are cultivated, is also strictly controlled. Indeed, the area is relatively small and exportable annual production varying between 400 metric tons & 1,000 metric tonnes is tiny by world standards, equivalent to 0.1 % of Colombian production or, put another way, equivalent to 3 hours of Colombian production! Highlighting its scarcity and exclusivity is the fact that Jamaica Blue Mountain is virtually the only coffee in the world to be packed in iconic wooden barrels, instead of bags. 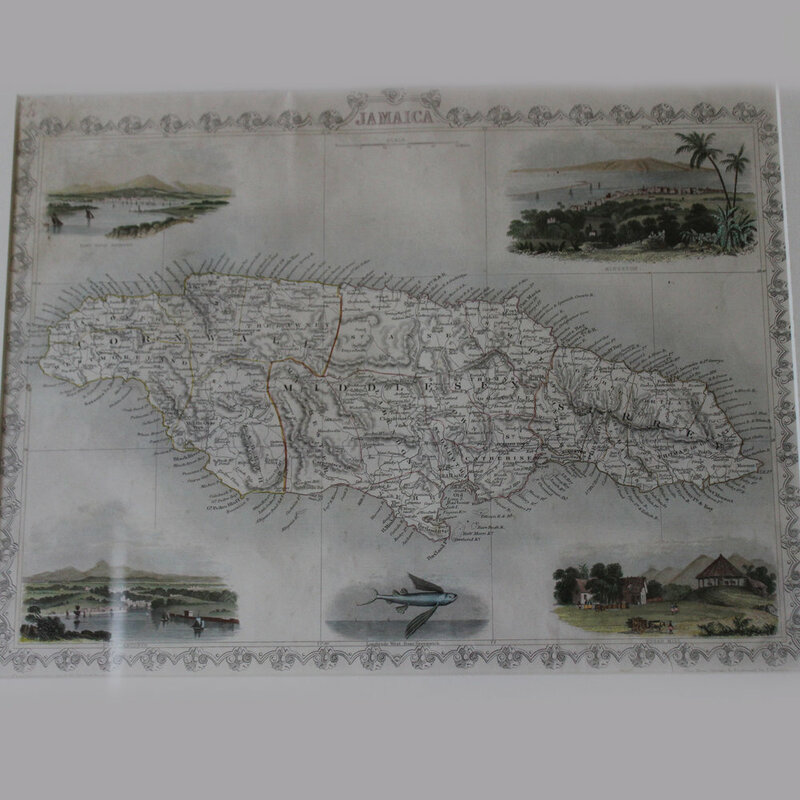 Returning to the coffee’s history, Jamaica became a leader in coffee and the largest producer in the world between 1800 and 1840, with production reaching 70,000 tons per year. In 1838, slavery was abolished and many coffee plantations were closed down to make room for newly freed slaves who began planting food crops for themselves. By the 1890s, the Jamaican coffee industry was in chaos and the government passed legislation to provide “instruction in the art of cultivation and curing by sending certain districts, competent instructors”. Quality control was a challenge for the next fifty years, with some improvements in the early forties, and then two events occurred. 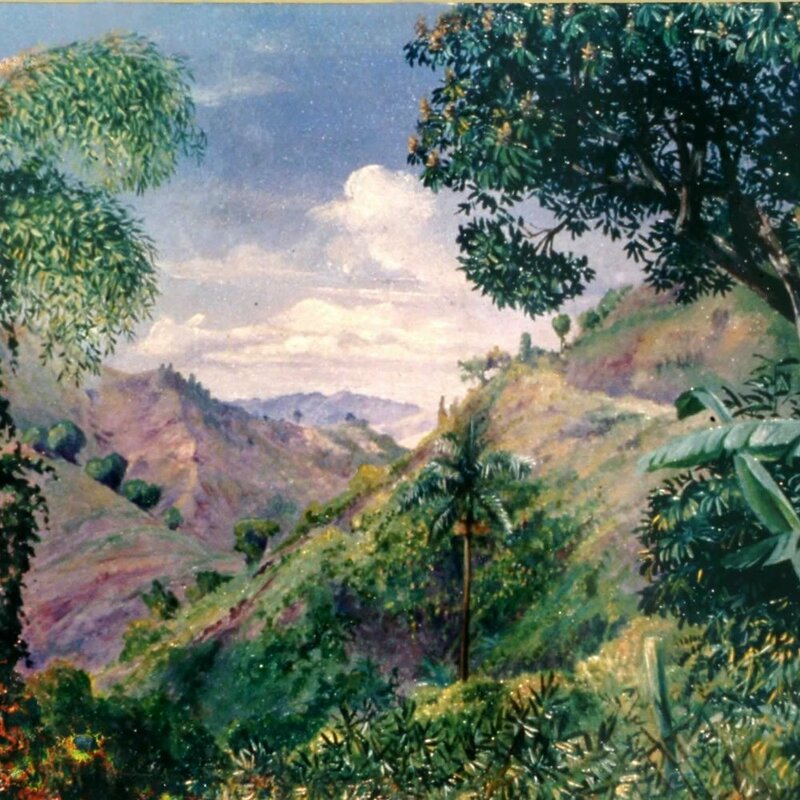 The first, in 1944, was the decision by the Jamaican government to establish a Central Clearing Coffee operation where all coffee for export had to be processed. The second was the creation of the Jamaican Coffee Industry Board (or the JCIB) in 1950 empowered to improve, control and maintain the quality and reputation of Jamaican coffee. The JCIB was recently amalgamated in 2018 with other Jamaican commodity statutory bodies to form JACRA (Jamaica Agricultural Commodities Regulatory Authority). As influential as ever, every barrel of coffee must go through JACRA for quality control where the green coffee is rigorously inspected before it is exported. This can take time and cause delays, but quality is paramount and strictly controlled, ensuring that all Jamaica Blue Mountain coffee leaving Jamaica is of the highest quality. Furthermore, JACRA sets strict standards for the growing, harvesting, processing and marketing of the coffee, making sure that the end result is always an excellent cup of coffee. Today, with annual production of Jamaica Blue Mountain green coffee remaining depressed and with 65% to 80% of it exported to Japan, Jamaica Blue Mountain remains as ever – elusive, luxurious, treasured and delicious. Jamaica Blue Mountain coffee is a globally protected certification mark meaning that only coffee certified by JACRA can be labelled as such. 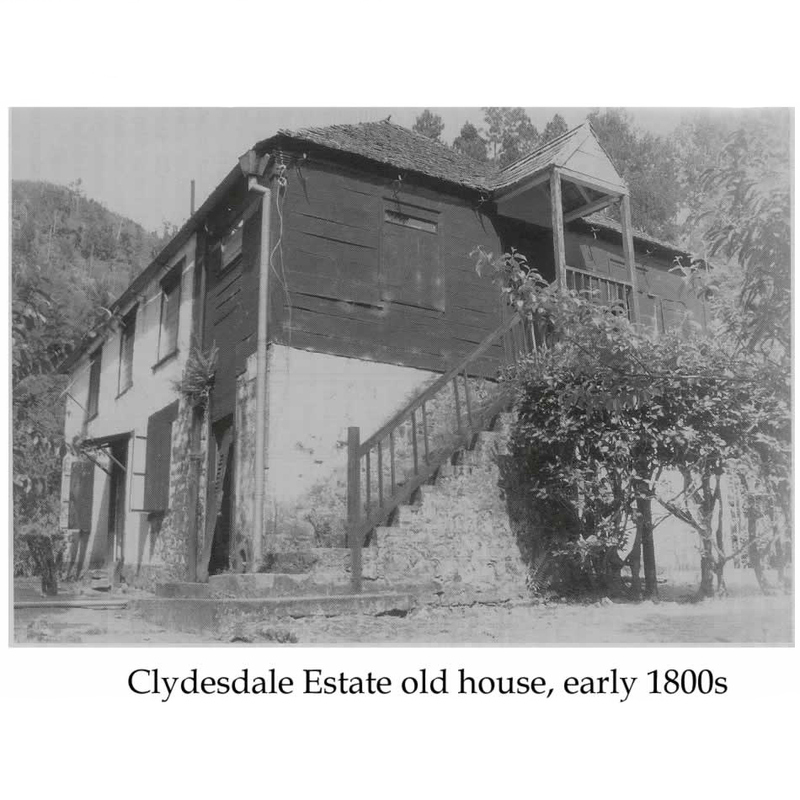 It comes from a statutorily recognized growing region in the Blue Mountain area of Jamaica. The Blue Mountains are located between Kingston to the south and Port Maria and Port Antonio to the north. 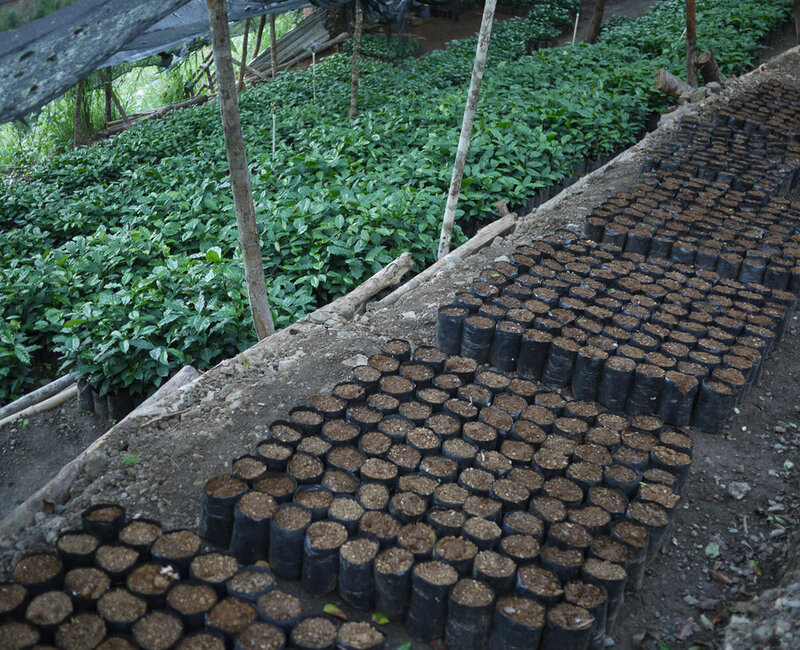 The coffee is grown in the Blue Mountain region in the eastern part of the Island. Rising to 2,350 metres, the Blue Mountains are some of the highest mountains in the Caribbean. The climate of the region is cool and misty with high rainfall. The soil is rich with excellent drainage. This combination of climate and soil is considered ideal for coffee. 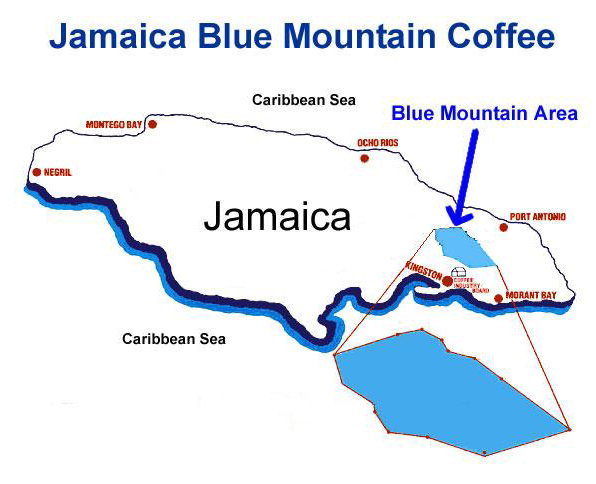 The Coffee Industry Regulation Act in Jamaica specifies what coffee-growing areas may use the label ‘Blue Mountain’. Additionally, it restricts the use of the Blue Mountain trademark to those authorized by JACRA. Coffee harvested from the parishes of Saint Andrew, Saint Thomas, Portland and Saint Mary may be considered Blue Mountain coffee. Additionally, only coffee grown up to 1,800 metres may be called Jamaica Blue Mountain. 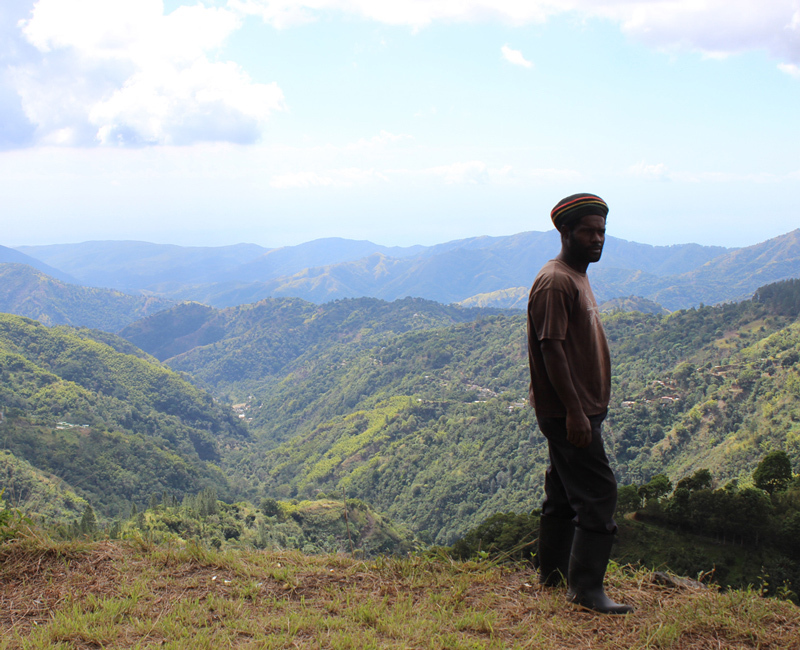 Most land in Jamaica above 1,800 metres is a forest preserve, so no coffee is grown there. 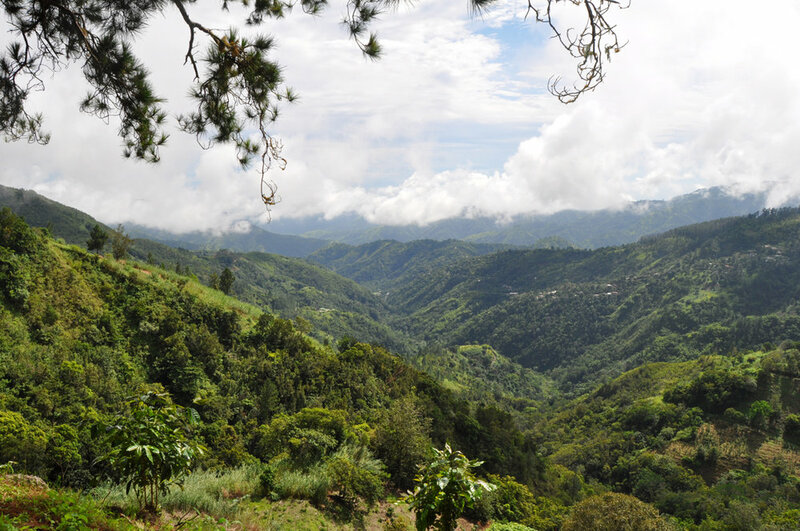 Jamaica High Mountain Supreme and Prime Washed are grown in different areas to the Jamaica Blue Mountains towards the west of the island. The Jamaica Blue Mountain bean is mostly Arabica Typica. The cherries are mainly delivered to the various producer-processor buying stations scattered around the Blue Mountains where they are subjected to float testing in specially built tanks. The larger farms & estates deliver the cherries directly to the processors' pulperies. The licensed estates have their own pulperies & finishing works. Jamaica Blue Mountain coffee is wet processed - normally by employing aqua pulpers (mucilage removal), although in a few limited cases, the operation is undertaken by the traditional fermentation method. The green coffee, exportable in barrels, comes in three screen size classifications covering the classic Blue Mountain flatberry coffee. Additionally, small quantities of peaberry are available in barrels. 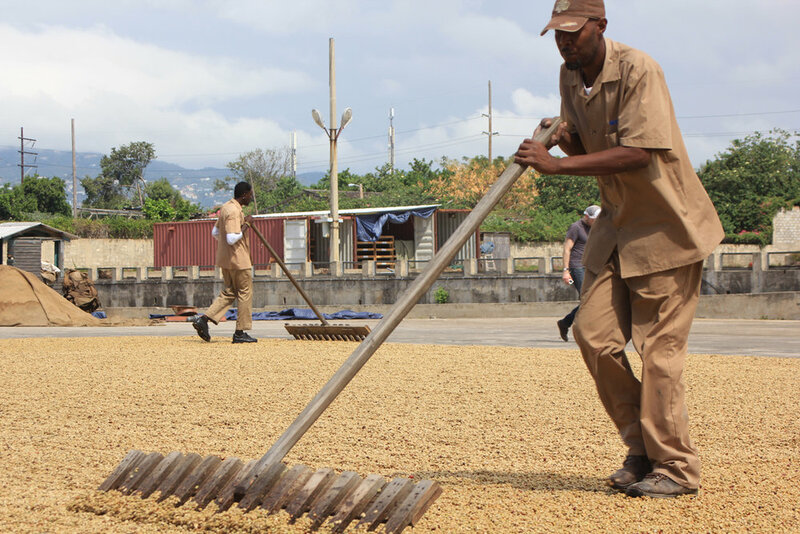 The green beans from the strict Blue Mountain area are inspected by the statutorily based Jamaica Agricultural Commodities Regulatory Authority (JACRA, formerly the Coffee Industry Board of Jamaica (CIB)), which handles, tests and arranges all the logistical side of exports. If the beans have too high a defect count or do not qualify in terms of size, shape, moisture content (max.12.5%), colour or cup any such non qualifying beans are categorised as Select. Jamaica has (early 2008) signed a multilateral agreement sponsored by the Japanese concerning testing for pesticide and chemical agent residues to a standard significantly beyond the international phytosanitary levels requested by either the European Union or other European countries. All green coffees exported from Jamaica, including those to Europe, are now being tested to this higher standard. Certain qualities of Select are allowed to be exported in bags as Jamaica Blue Mountain to such markets as Japan. The other rejected coffees enter the domestic roaster market for local consumption, including the tourist sector, as well as for export as roast Jamaica Blue Mountain. Coffee grown in other areas, mainly outside the Blue Mountains, may also be exported, albeit in limited quantities, and fall into two main classifications: High Mountain Supreme and Prime Washed Jamaican. These may not be called or employed as Jamaica Blue Mountain coffee. The barrels are sealed, ICO-marked with a unique number shown on the documents including the all-important Certificate of Origin. Additionally, the shipping marks of the registered exporter and official importer are stencilled on to the barrels of each shipping lot. 1. 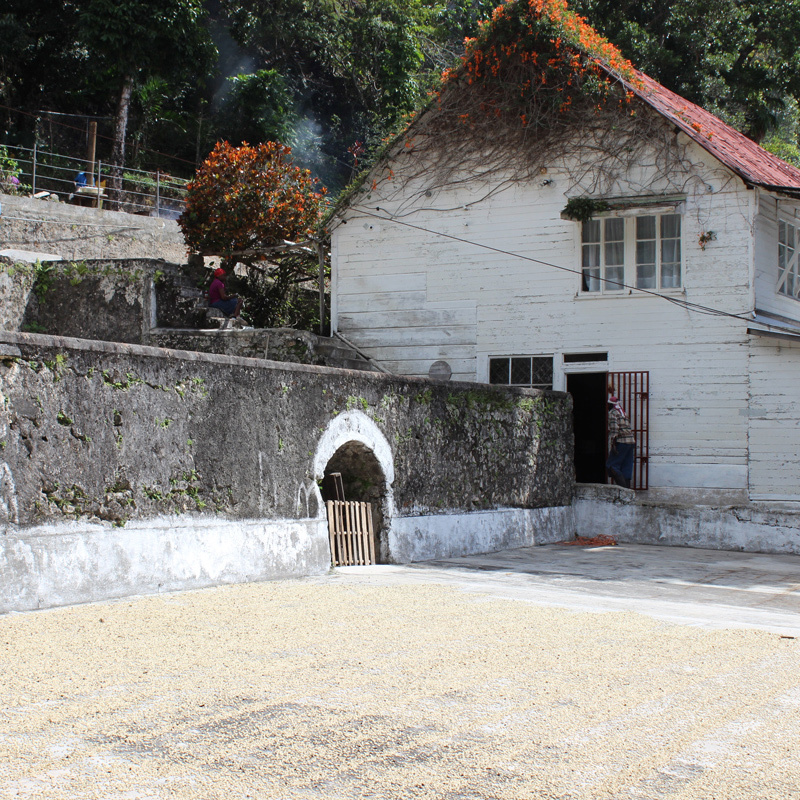 The Jamaica Blue Mountain coffee is stored in parchment, sometimes in bags & sometimes in wooden silos, before processing. 2.The coffee is dried by a combination of sun drying and mechanical drying. The parchment coffee is then stored in bags for at least 8 weeks and, after this resting period, the parchment is hulled. 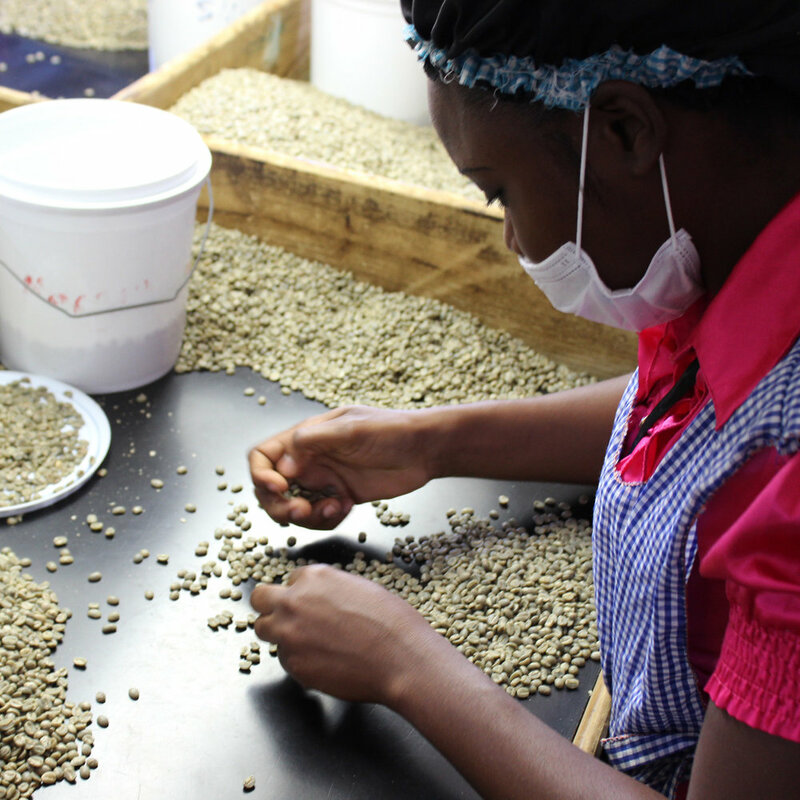 The resulting green coffee is graded by size and density, and the defects are hand-sorted. The coffee is finally packed in wooden barrels (70kg, 30kg, 15kg as described above). 3. The screen size grading equipment and the gravity table (classification by density) also clean the coffee. Later on, to repeat, the defects are picked out by hand. 4. The Grade 1 coffee is sieved to a screen 17+ (17/64 inches or 6.75mm) size with size grading equipment. 6. Maximum defects allowed is 2%. 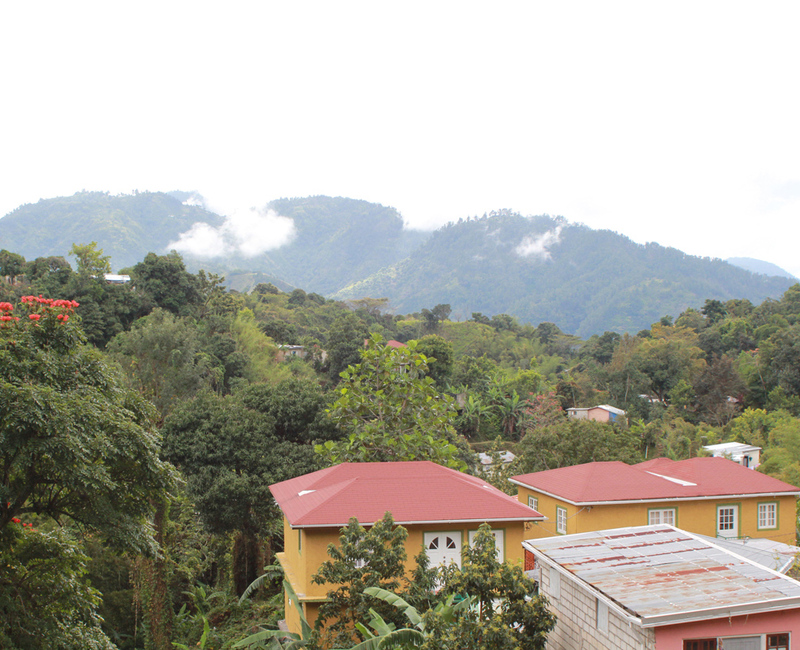 JBM Select Coffee is produced in the Jamaican government-designated area known as the Blue Mountain region. The Jamaica Blue Mountain Select grade is a combination of No. 1, No. 2 & No. 3 beans. As its provenance states, this is a coffee that has all the Jamaica Blue Mountain coffee cup quality characteristics and is packed green in 60kg net weight hessian/jute bags. Maximum of 4% minor defects. Screen size from 15-18. Blind Assessment: Sweet-toned, soft, very delicate aroma with orange, floral and pungently buttery (butterscotch?) notes. In the cup light to medium bodied but silky in mouthfeel, with a gently bittersweet character and crisp chocolate and orange peel notes. As the cup cools an attractive mint-like note also emerges. The chocolate and orange notes linger impressively in the long, clean finish. The coffee is currently not certified under any form of "Fair Trade" label but two estates, including our Clifton Mount Estate which is the only such certified coffee going to Europe, have secured Rainforest Alliance certification. However, in the case of the independent farmers and smallholders, where the workforce is almost entirely family and neighbour based, the licensed estates & processors operate a pricing regime combined with a pre-funding and balancing payment mechanism which categorically favours the smallholder farmer. This operation has anticipated much which has subsequently become fashionable elsewhere. The processors, supported in part by JACRA, supply thorough extension services and support to the farmers covering fertilisers, etc. and, when and where necessary, spraying. JACRA has operated an insurance scheme to assist farmers in time of hurricanes and other catastrophes. In the case of the larger farms which sell to the processors & the independently licensed estates, the workers are paid and employed under conditions regulated by strict Jamaican labour legislation. In this regard, wage and benefit levels are significantly higher than the regional norms. The workers tend to come from neighbouring communities and, in most cases, accommodation, recreation, educational, shaded, sanitary & medical facilities are near to hand. Few of the farms are isolated in this regard and have a reasonable and accessible infrastructure. The workers at the processing, sorting and warehousing facilities are provided with similarly well-adjusted wages and conditions as well as training. The coffee is grown under naturally shaded and fauna-friendly conditions on vertiginous slopes. As the coffee is wet-processed, all the waste water resulting from the coffee processing is fully treated and purified before being released into the environment. Composting and waste mucilage recycling are becoming the norm. Although Jamaican coffee is not in the main certified as organic, nevertheless, a very discretionary and circumspect use of fertilisers, pesticides and fungicides is the rule. However, because of the high contingent value of the crop, JACRA and the individual farmers could not undertake never to employ these agents. Soil erosion management practices are energetically pursued. 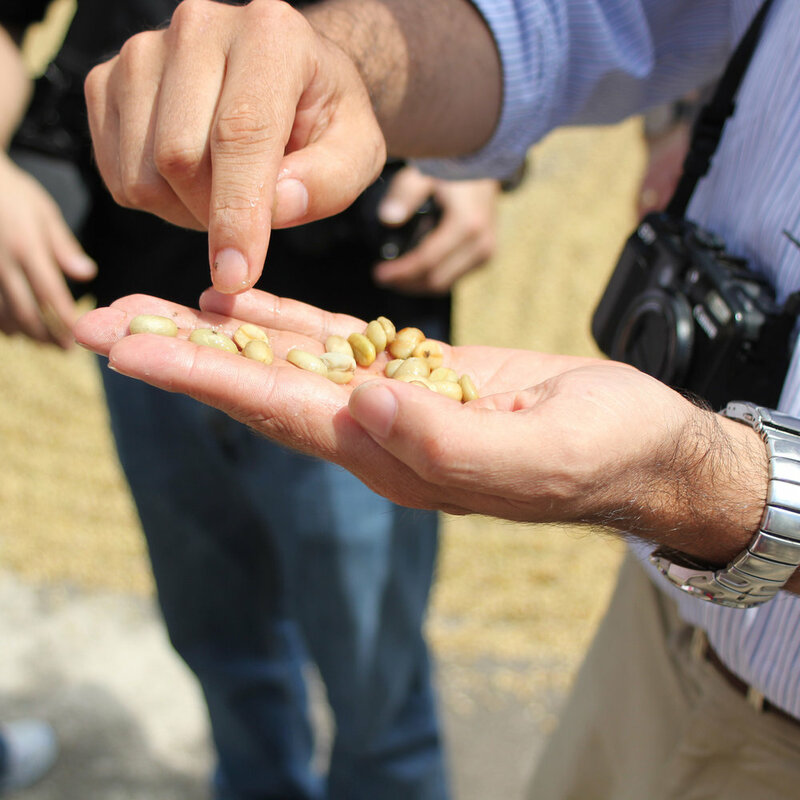 All coffees can easily be traced back to the processor & estate and a Certificate of Origin is issued with each batch. However, only in the case of the estates, which are licensed to export, can the coffee be traced back to a relatively few hectares of land. Nonetheless, it should be remembered that the total area of production is only around 6,000 hectares, the size of a large Brazilian fazenda. With a yield in a prolific year of around 1,000 metric tons of green beans - this consideration alone guarantees traceability. JACRA (formerly the Coffee Industry Board) has, over the past several years, conducted a worldwide campaign to ensure that the name Jamaica Blue Mountain is neither abused nor misrepresented. It has registered the JBM name, together with variations of the name and associated names, in most countries. It has issued directions and guidelines on packaging labelling concerning the use of the JBM name, full details such as addresses, description, coffee preparation directions, expiry date and batch number, etc. The estates & processors have or are doing the same in order to protect their names. Blue Mountain Coffee Group Ltd.